*See tips, below, to substitute King Arthur Unbleached Self-Rising Flour. 1) Preheat the oven to 350°F. Lightly grease two standard doughnut pans. If you don't have doughnut pans, you can bake these in a standard muffin tin; they just won't be doughnuts. 2) Beat together the oil, eggs, sugar, pumpkin, spices, salt, and baking powder until smooth. 3) Add the flour, stirring just until smooth. 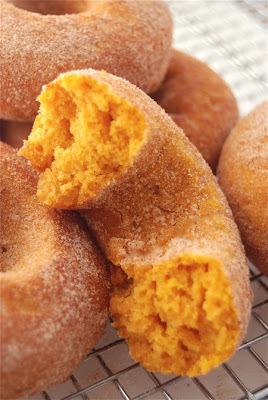 4) Fill the wells of the doughnut pans about 3/4 full; use a scant 1/4 cup of batter in each well. If you're making muffins, fill each well about 3/4 full; the recipe makes about 15, so you'll need to bake in two batches (unless you have two muffin pans). 6) Bake the doughnuts for 15 to 18 minutes, or until a cake tester inserted into the center of one comes out clean. If you're making muffins, they'll need to bake for 23 to 25 minutes. 7) Remove the doughnuts from the oven, and after about 5 minutes, loosen their edges, and transfer them to a rack to cool. 8) While the doughnuts are still warm (but no longer fragile), gently shake them in a bag with the cinnamon-sugar. If you've made muffins, sprinkle their tops heavily with cinnamon-sugar. 9) Cool completely, and wrap airtight; store at room temperature for several days. Yield: 12 doughnuts or 15 muffins. Want to make these doughnuts with King Arthur Unbleached Self-Rising Flour? Reduce the salt to 1/2 teaspoon; omit the baking powder, and substitute 2 cups (8 ounces) self-rising flour for the all-purpose flour. Bake the doughnuts for about 18 minutes.